Home › Mystery › Top 10 Mysteries of 2016? Top 10 Mysteries of 2016? As 2016 comes to a close, let’s take a moment to look back at the year’s most popular mysteries. Based on circulation figures at the library where I work, these were the most checked out mysteries in 2016. Considering last year’s list, is it any surprise that one particular author once again dominated the top ten? It’s a tie! X by Sue Grafton & Dark Reservations by John Fortunato — Private Investigator Kinsey Millhone was on the trail of a tricky serial killer in Grafton’s latest. (Although it is disappointing that X is for… just X.) And in Fortunato’s 2015 debut novel, a Bureau of Indian Affairs special agent facing forced early retirement may get a reprieve when the bullet-ridden car of a Congressman turns up 20 years after the man disappeared in the midst of a corruption probe. Dead to the Last Drop by Cleo Coyle— In the 15th entry of the cozy Coffeehouse Mystery Series, Clare Cosi learns Washington, D.C. can be murder when a State Deparment employee turns up dead in her coffeehouse and the President’s daughter goes missing. Includes recipes for coffee addicts. Even Dogs in the Wild by Ian Rankin— A senior government prosecutor is killed in an apparent robbery, but nothing is missing from the man’s home. Instead an ominous note is left behind and Rebus will come out of retirement to investigate. The Scam by Janet Evanovich & Lee Goldberg— Stephanie Plum and Mr. Monk team up… well actually their authors once again unite to pen the fourth tale of master thief Nicolas Fox and FBI agent Kate O’Hare. Fox and O’Hare go deep undercover to clean up an international money-laundering operation. Playing with Fire by Tess Gerritsen— In this standalone thriller by the author of the Rizzoli & Isles series, a violinist discovers “a curious piece of music—the Incendio waltz” which leads her on a quest to uncover its shrouded history, but a powerful family will go to any length to prevent the truth coming to light. A Banquet of Consequences by Elizabeth George— Inspector Thomas Lynley and Detective Sergeant Barbara Havers investigate the link between a young man’s suicide and a horrific case of poisoning in Cambridge in this 19th book in the series. I should note that this particular title may have gotten a boost by the fact that Elizabeth George appeared in Syracuse as part of the Rosamond Gifford Lecture Series, one of the most highly-acclaimed authors series in the country. Brotherhood in Death by J. D. Robb aka Nora Roberts—In the 42nd installment of this futuristic, sci-fi light series, Lieutenant Eve Dallas uncovers a conspiracy while investigating the disappearance of a former U.S. Senator. 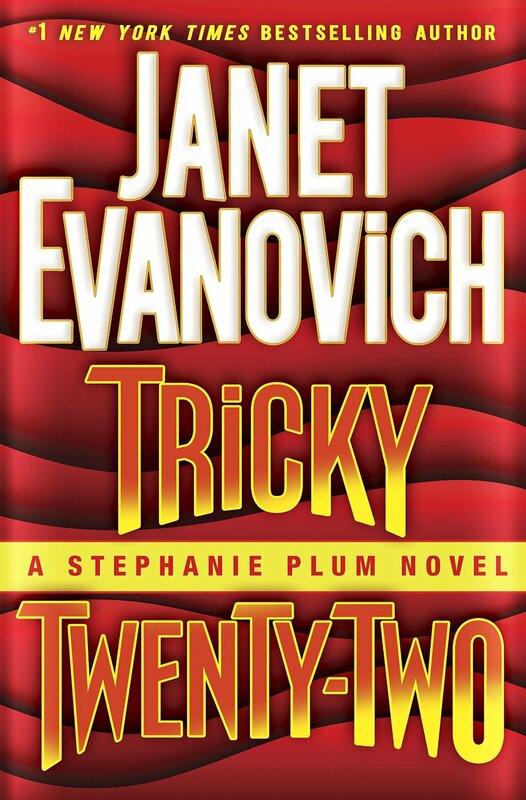 Tricky Twenty-Two by Janet Evanovich — Once again, Evanovich tops the list with bounty hunter Stephanie Plum’s 22nd adventure. Stephanie is out to nab Ken “Gobbles” Globovic, the leader of a fraternity, involved in an assault on a college administrator and gets mixed up in the shooting deaths of two businessmen. And there you have it, the most popular reads of 2016. Last year, I predicted Evanovich’s Tricky Twenty-Two would rank on this year’s list, but I didn’t anticipate how high! I also expected Cornwell’s 23rd Kay Scarpetta book, Depraved Heart, to crack the top ten, but it fell a little short ending up in 12th place. As usual, several books in the top ten were actually published late in 2015. Their being new and current lasted into 2016, and ranking on this list proves their enduring value as entertaining and intriguing reads. So it may be safe to expect Evanovich’s Turbo Twenty-Three, Cornwell’s Chaos, and P.D. James’ The Mistletoe Murder (all published in the final months of 2016) to appear on 2017’s list! As for the top mystery picks of 2016, are you delighted or disappointed? How many have you read? And which books would make your list of the top ten mysteries of 2016? What are your 2017 mystery reading resolutions?